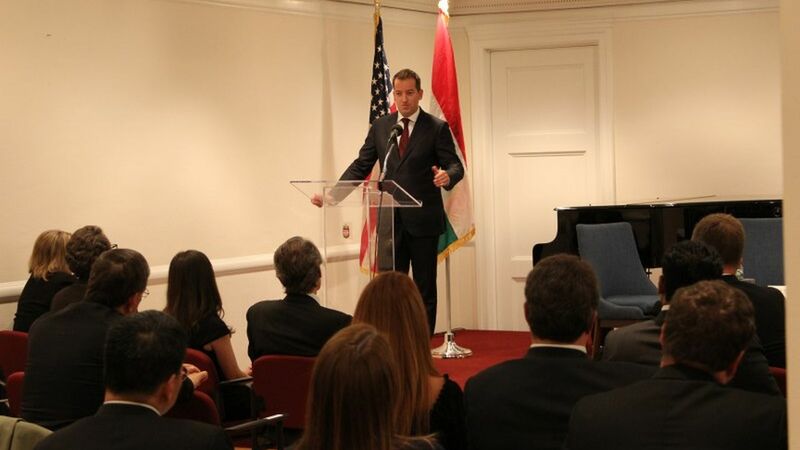 The Consulate General of Hungary in New York hosted a special event where investment opportunities in Hungary were put into limelight. In the framework of the investment forum "Hungary: Where Innovation Creates Value", this year Péter Szijjártó, Minister of Foreign Affairs and Trade and Róbert Ésik, the President of the Hungarian Investment Promotion Agency (HIPA) presented the "Chain Bridge Budapest Award" to BlackRock. The prize, which could be first won last year, went to the US company for its international career events reaching out to Hungarian experts around Europe to invite them home. Each year the "Chain Bridge Budapest Award" is given to a US-based company that strongly contributes to the economic and social growth of our country. In the first year of its history, in 2017 the prize was granted by a dedicated group of professional entities to IBM, which has been creating high added value jobs in Hungary for long decades. The New York-based asset management company, which only had eight people at the time of its foundation in 1988, can now boast with approximately 14,000 employees. Being present in 30 countries, its colleagues are responsible for the management of assets totalling almost USD 6,300 billion. January 2017 was a milestone in their history: BlackRock announced the opening of its innovation and technology centre in Budapest. Although the company's decision was largely affected by the government and HIPA's commitment to the successful delivery of the project, the standards of living, the workforce and the modern infrastructure that our capital can offer had also been decisive. Currently the world's largest asset management company has 430 colleagues in its innovation centre in Budapest, where daily operations include the improvement of different corporate technologies, product development, the restructuring of the distribution channels, alongside their quest for better client data usage and analysis, and innovative and creative marketing solutions. As a consequence of the career events in London and Frankfurt, over 50 Hungarian professionals decided to return to the country to the invitation of BlackRock, armed with a strong command of foreign languages. Thus in 2018 the "Chain Bridge Budapest Award" goes to BlackRock, which offers a real alternative with its first innovation centre in Europe to motivate and inspire Hungarian citizens living and working abroad to come back to the homeland.